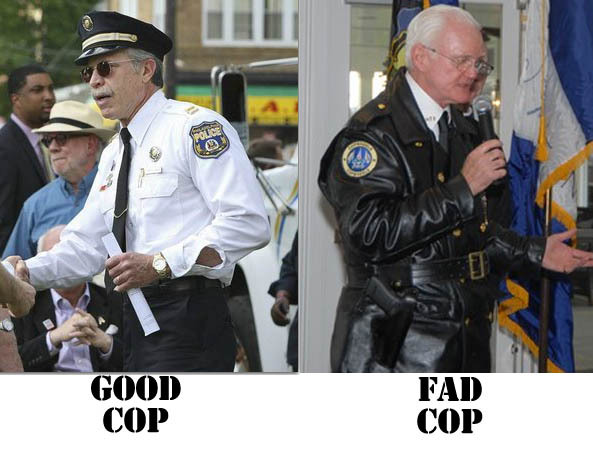 Is Upper Darby the crazy crime capital of Pennsylvania, or has its publicity-seeking police chief created that impression? Well, from stashes of frozen cats to daughters gnawing on their moms to families of naked, musical protesters, there does seem to be plenty of offbeat offenses. And is it just us or do an inordinate number of these crimes involve inappropriate sexual conduct…? Is it possible that there are people in this city who think it’s a BAD idea for large men to sucker punch smaller women? Even if the puncher is a uniformed public servant and the victim is an annoying drunk? Well, if you’re one of those hard-core Philadelphians who think it’s normal for the police to be wailing on the citizenry then you should exercise your right to PARTY! 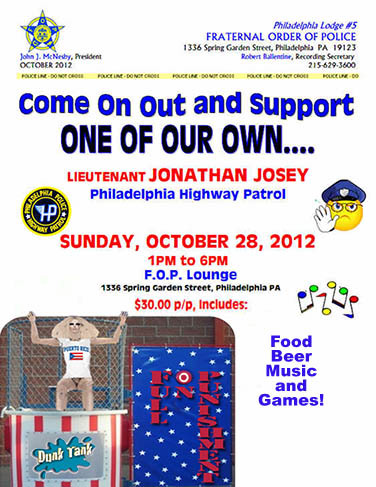 The FOP is offering beer, food, music and mixed drinks in support of the beefy officer who simply defended himself from an out-of-control skinny lady. I wonder if there’ll be any games…? Anyway, it’s just nice to know that there’s ONE place left on the East Coast where gals are taught their place. Thank goodness it’s always 1957 in Philadelphia! 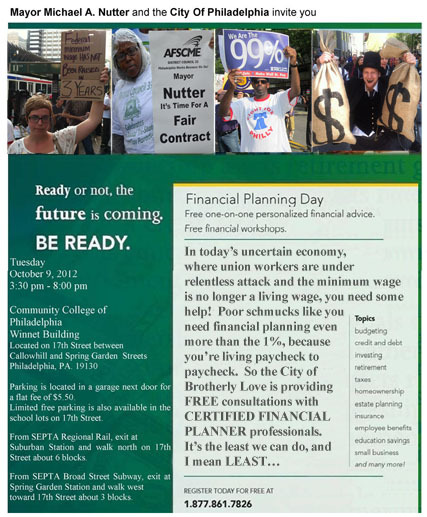 Financial Planning for Philly’s 99%! Thanks, Mayor Nutter! We’ve had Reaganomics and, now, Obamanomics, but closer to home we may be seeing a new mayoral riff on “the dismal science.” This being the Greenest City in America, we’d like to call this brand of financial finagling: EcoNutmix. The principals of EcoNutmix seem to include starving the union beast, raising property taxes during an economic downturn, and spending lavishly on a fancy concert for you celeb friends. Philly’s unionized workforce (folks forced to reside in the city; aka taxpayers) has not seen any sort of raise, step increase, or cost of living allowance in over 3 years, but HAVE seen increases in health insurance premiums and union dues (Thanks, DC47!). And our mayor has refused to make a good faith effort to negotiate these economic (and other) issues with union leadership, so his recent invitation seems a bit Romney-esque. (Rumor has it that Nutter is headed to DC if the Dems are reelected, but maybe he’s playing both sides of the political coin in order to insure he can get outta Dodge?) The mayor has invited all city employees to meet with a CERTIFIED FINANCIAL PLANNER™ professional (yes that’s a trademarked term). 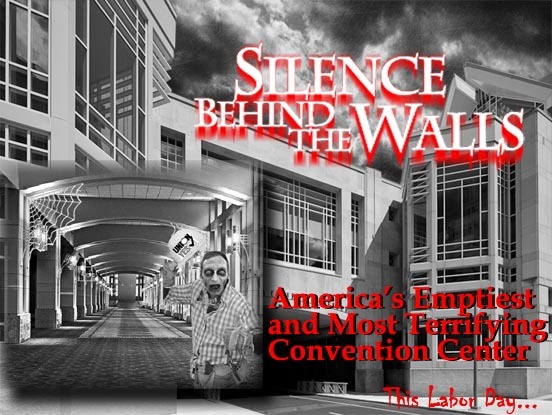 It seems the Pennsylvania Convention Center has come a long way in terms of customer service for conventioneers. Now it is MUCH less likely that union employees will shut down all the electricity in advance of your conference like they did back in 2004. It should be stressed, however, that poor customer relations IS NOT a Union problem! Union boss, “Johnny Doc” Dougherty, has called for privatization of the center by some worthy corporation (like a subsidiary of his political patron, Comcast) in order to improve customer service…It’s the unprofessional, local bureaucrats who ruin the convention experience, NOT the unions. Sure, there are a few complicated work rules and maybe an extra fee or two, but Philly’s a complicated place with lots of history. But what happens if by some chance we DON’T have enough conferences and conventions in our center?? What becomes of such a large empty building? 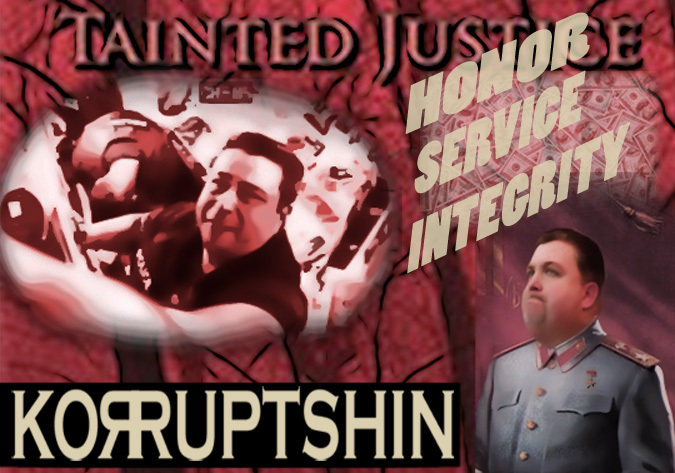 FOP to Former Cop: Who do you THINK you are, some rich lawyer?!?! He’s not respecting the uniform. People died for that uniform. It’s not Halloween. Who was he speaking about? If you guessed the ACTUAL POLICE OFFICER then you would be right. 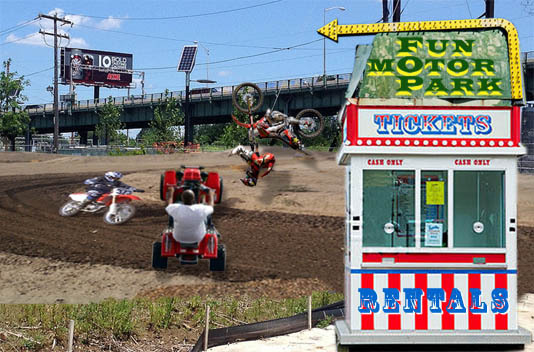 In Philadelphia, there’s no crime we hate worse than a thought crime. You can sell drugs, not pay your bills, create hazards for public servants, pummel innocent bystanders on the street, and a few other nefarious activities and you’ll probably get away with it. If you engage in this sort of behavior because of SOME IDEOLOGY then you’re gonna get beat down. Blocking traffic and destroying private property as part of a Phillies celebration — no problem. Blocking traffic in an effort to call attention to economic inequality in America — you’re a menace to society! We should probably just abolish the 1st Amendment – it causes so much trouble – and make the 2nd Amendment #1. It’s almost impossible for the average Philly cop to understand some sort of ideological argument, but easy to shoot somebody. Why should they be forced to think so hard when they’d much rather just taser perps? If we’re going to hold that 2nd Amendment sacred, then it might be best to eliminate the 1st. Then, people might really think twice about opening their big mouths, so they’d be much less likely to get shot once everybody’s packing. A win-win proposition.